For the past few mornings, I noticed the air felt less humid, almost…dare I say…cooler. While it’s not by any means jeans and boots weather, the cooler mornings definitely put me in the mood for pumpkin flavored treats, like a Pumpkin Apple Smoothie. 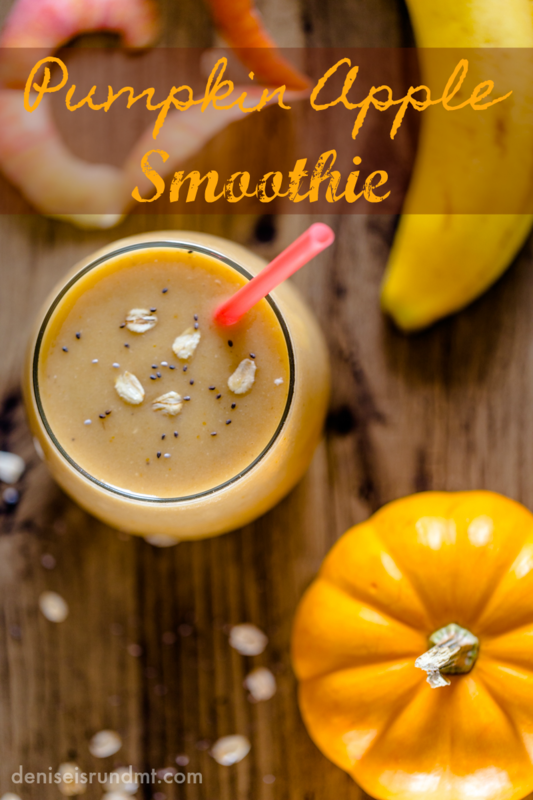 Today’s fall flavor smoothie recipe is a guest post by Victoria of How Daily. Victoria is a home cooking mom and a food blogger who loves to share recipes and culinary tips from her diversified experience of multi-cuture. Concocting smoothie recipes is one of her spare time hobbies. Check out Victoria’s article perfect for smoothie blenders. Being busy blogger moms on the run, Victoria and I appreciate the healthy goodness of smoothies. Smoothies are quick on-the-go protein-packed breakfasts that are perfect breakfasts for busy families. 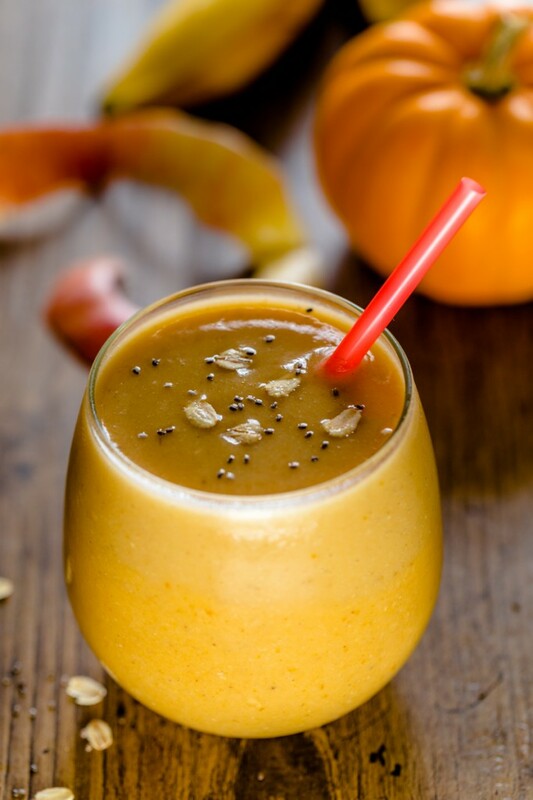 Read more to see why you will want to sip on this Pumpkin Apple Smoothie this season. Autumn is a lovely time of the year and what better way to celebrate the season than with this delicious smoothie that combines two of fall’s most beloved treats. 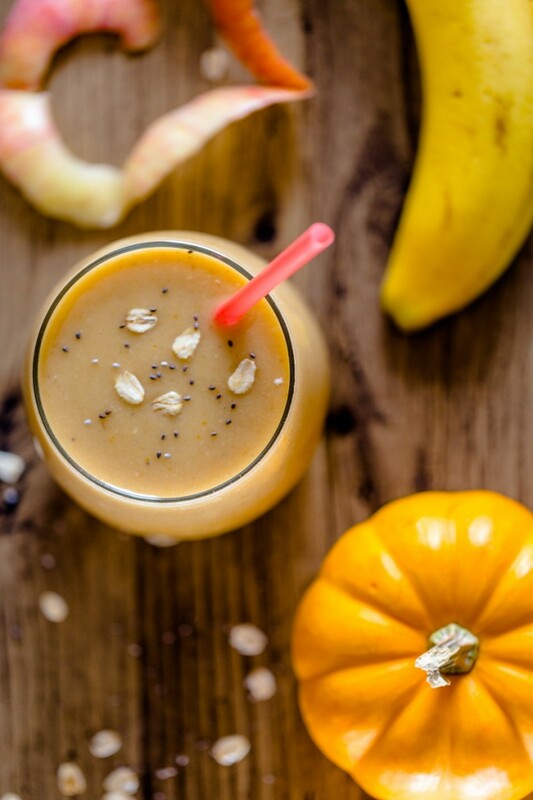 Nothing says autumn quite like pumpkin and apples, which is why we’ve decided to combine the two into a mouthwatering and undeniably healthy smoothie. 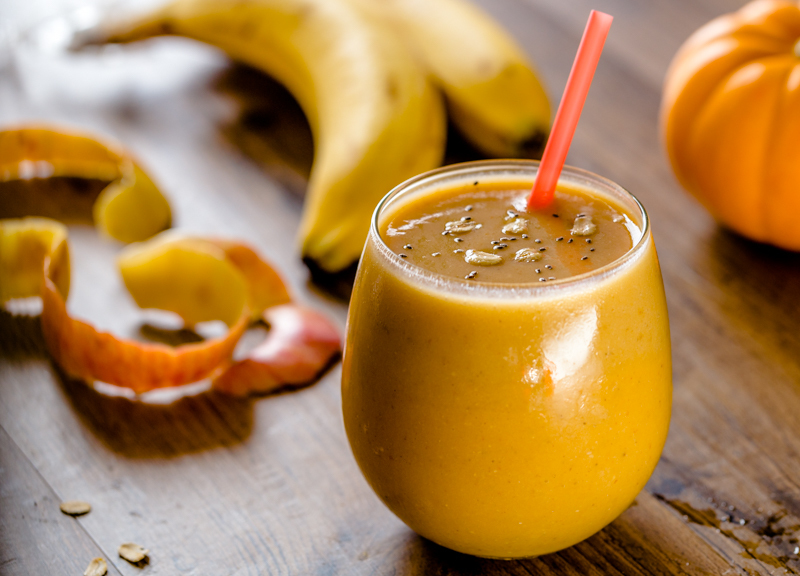 This incredible pumpkin-apple smoothie is an ideal choice for breakfast on the go, and it packs plenty of protein and fiber to provide hours of energy. Using Greek yogurt, chia seeds, oats, coconut milk and fresh fruit ensures that this smoothie won’t add inches to your waist line. By using a fresh apple, the smoothie turns out slightly tart and sweet without the need to add extra sugar or other sweeteners. However, if you prefer your smoothies on the sweeter side, you can always add a bit of honey until you reach your desired level of sweetness. Still, I highly recommend tasting the smoothie before adding any honey, as it really shouldn’t need it. The addition of cinnamon, ginger and pumpkin pie spice also provides a taste that couldn’t be more quintessentially fall. In fact, it tastes almost exactly like a slightly tarter version of pumpkin pie, made even more delectable thanks to the addition of the apple and banana. For this reason, I sometimes choose to serve it to guests as a dessert or even just a snack. Healthy, hearty smoothie rich in vitamins and protein that combines all the flavors of fall. Place the half of a banana in the freezer at least an hour prior to making the smoothie. If you’re planning on making the smoothie for breakfast, it is easiest to toss the banana in the freezer the night before. Using a frozen banana helps to give the smoothie a creamier texture, but you can also skip this step and use an unfrozen banana if you’re in a hurry. Place the chia seeds and oats in a blender or food processor. Blend for approximately 30 seconds until the seeds and oats are finely ground. Add the remaining ingredients to the blender, and then blend for another minute or two until smooth. It is usually best to only add approximately half of the ice at the beginning, and then add more as you go until the mixture reaches your desired consistency. If the smoothie looks too thin, you can add more ice to thicken it up. Alternatively, you should add more milk if you feel the smoothie turned out too thick. Pour out into glasses and enjoy immediately. Try a few more of my favorite pumpkin recipes. This entry was posted in food, health, Life, recipe and tagged autumn, breakfast, fall, food, healthy, Life, nut free, pumpkin, recipe, Run DMT, smoothie.